Why the extra X? 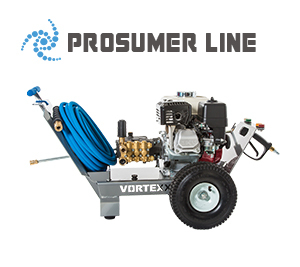 Vortexx’s goal is to provide the very best pressure washer on the market, so every day they seek ways to provide “eXtra” value, quality, features, etc. The result? You will notice immediately that Vortexx products are simply better by design. Since each Vortexx is hand built, each and every unit is ran and tested before it even leaves the line. This exceptional quality control allows Vortexx to back-up their product with the BEST Warranty Combination in the industry with up to 6 Years on the Engine, 5 Years on the Pump and Lifetime on the Cart! These gas powered pressure washers for personal use are built for that serious do-it-yourself mentality. The right combination of PSI and GPM, nozzles, attachments, and cleaning solutions will allow you to wash siding and windows, walkways, driveways, patios, decks, fences, and more. We offer various models fit for personal use including the Homeowner and Homeowner+. If you are looking for a gas power pressure washer focused on home use, but have been spoiled with using the best tools every day on the job and don’t need a purely professional unit in your garage then one of our Prosumer units are for you. 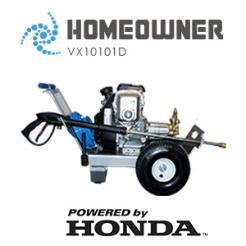 Our Prosumer models have been upgraded with GX Commercial Grade Honda Engines and pumps with longer life expectancy. These units are great for big and small jobs including cleaning tar, gum, or stubborn stains from concrete, removing rust from steel, removing marine growth from boats, and more! Our Prosumer line consists of the Prosumer and Prosumer+. 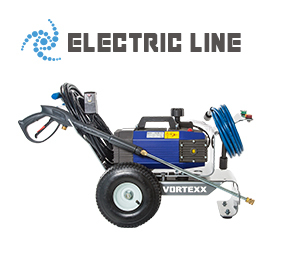 Vortexx offers a full line of commercial grade gas power washers. The tough U-shaped cart construction ensures that any model in the PRO series will hold its’ own through every day heavy duty use. This line of pressure washers boasts greater pressure (PSI), water flow (GPM) and horse power (HP) as well as overbuilt pumps that are meant to log thousands of hours on the job. Applications include removing paint from wood, masonry or metal, eliminating stubborn grease or dirt from equipment, wiping out heavy mildew stains, and more. Our Pro line consists of the Professional 3000, Professional 4000, PRO+Gear Drive, and PRO+Belt Drive. All hoses and cords stay attached to carry unit when un-docked. Professional grade motors and triplex plunger combos powered by AR. Upgraded hoses and guns – maximum pressure and flow allowed in category while operating on standard 110 power. 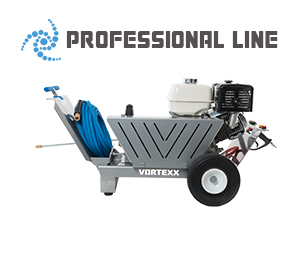 The Vortexx Professional Hot Water Pressure Washers don’t look like any hot water pressure washers you have ever seen – and that’s by design. Innovations in safety, usability and performance are evident at first glance and for many will be love at first sight!